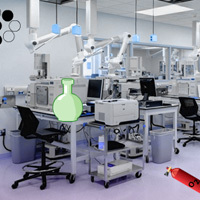 Wow Biochemical Lab Escape is another point & click escape game developed by WowEscape. In this game, you came to do some research in a biochemical lab. But unfortunately, someone locked you in from outside. You have to find the way to escape from there by finding useful objects, hints and by solving puzzles. Click on the objects to interact with and solve puzzles. Good luck and have fun! There's an error in the clue for the circle of blood types. One of the red clues should be B+, not A+. When you get a magnifier in the 2nd set, use it on a white spot on a wall in the 1st set. The "20 Hrs" clue on the wall in the 1st set is one of 3 plain-sight clues you'll need for a puzzle in the 2nd set. The other 2 clues are also in the 2nd set. Otherwise, fun and straightforward game. Star lost for that one clue error. OK - I cant get out of first scene. Done most things but key eludes me. No measurement for flasks which may be in second set. Scales not working either. Any help would be appreciated. I have all cotton reel looking things except for one. where do the blue thermometers go in third scene?